How will this be published? is one of the first questions I ask clients who want to make a book. Why? It influences design choices and has a huge impact on your bottom line. Offset and digitally printed books require page counts in multiples of four. Some on-demand photo book publishers require multiples of two. Electronic books can have any number of pages. Offset printed books are either in spot (PMS) color, four-color process, or a combination of both. Digitally printed and electronically delivered books can be in any color that the printing or reading device, respectively, can render. Offset printed books typically require artwork with high (300 dpi) resolution. Artwork for digitally printed publications requires half that (150 dpi), and artwork resolution for electronic pubs is typically even less. For offset and digital printing, designers will work with a printer early on to maximize the number of pages that can be printed per sheet. Electronically published books are typically optimized for the primary screen on which they’ll be read. If your printed book is a self-mailer, the weight of the paper is crucial. The wrong page size (see above) and a too-heavy stock can quickly max out your postage budget. What does this mean for your bottom line? Did you know that an offset or digitally printed book can take as long to design as a PDF? Though a PDF will obviously be less expensive to distribute. An electronic publication that’s web- or tablet-based—especially one that requires any kind of interactivity or special features—is a totally different beast from a print or PDF publication and may require a designer with a different skill set. Deciding up front how your piece will be published maximizes your dollars and assures that you’re hiring the right designer from the start. Can you publish more in than one format? Absolutely! 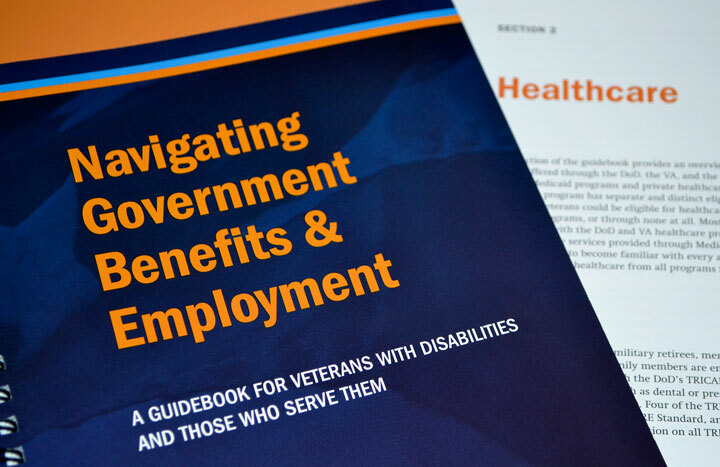 Last year, I worked with Syracuse University’s Institute for Veterans and Military Families (IVMF) on their handbook, Navigating Government Benefits & Employment: A Guidebook for Veterans with Disabilities and Those Who Serve Them. The IVMF published the four-part, 136-page book, in collaboration with Griffin-Hammis Associates LLC, in response to a need for more easily accessible and organized information on governmental benefits available to veterans and their families. “We provided both a PDF version and print publication so that the guide would be accessible at no cost, and disseminated very widely, electronically, and so that those who prefer the ability to work on paper, with the ability to make notes, mark pages, or refer to hard copies in person may also access the information,” said James Lee Schmeling, IVMF managing director and co-founder. They also entered into a fulfillment agreement with their university bookstore, making it easy to acquire the book at cost plus shipping, he added. Knowing that the book would be available in multiple formats helped us make solid production decisions early on regarding page count, colors, artwork, size, and stock—all of which kept the job on track. Learn more about, purchase, or download the guidebook PDF. For this simplified discussion, offset printed books are ink on paper. Digitally printed books are also on paper but printed by large-format laser or inkjet printers. Electronic books are either PDFs or web- or tablet-based publications.